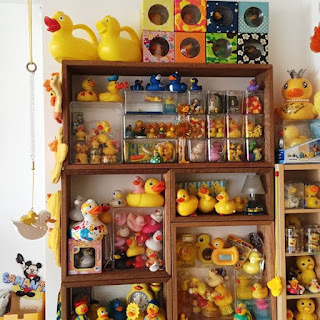 Welcome to a brief peek into the world that is Duck Palace… a sanctuary that Sammy and friends visit as a source of creativity, inspiration and healing. Ducks have arrived from all over our planet and enjoy visiting so much that they never leave. Thanks to all those who have encouraged Ducks to come our way…we can assure you that they’re happy and well cared for. In case you’re interested, there are lots of FAQ’s at the bottom of this page. ​My “Collection of Ducks” Prints, Cards and iPhone4 Cases are now available at Redbubble as well as some other Duck designs! They are available with either black, white, blue or pink backgrounds. For you Duck Lovers out there, I’ve also created a fun Duck Calendar and a Felix Calendar. You can choose to begin at any month you like, just select when you order via Redbubble. How Many Ducks Live In The Palace? I have no idea, as you can see by the photos on this page, there are lots! Do All The Ducks Appear In The Photos On This Page? Hmmmm, no. Some Ducks can get a bit mischievous and sometimes sneak into Duck Palace without getting their photo taken. Others appear on facebook but not here. I’ve also created some blogs posts with lots of Duck photos – if you visit my blogs and search for ‘duck’ or ‘ducks’, you should find them all. Do You Adopt Ducks That Need Rehoming? Yes! 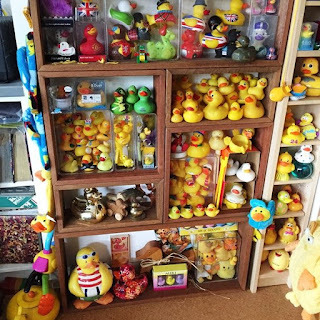 Sometimes people can no longer look after their quackers and send them to live in Duck Palace. Well I’ve adored Donald Duck for as long as I can remember. And I think that Yellow Rubber Ducks are such wonderful smiley creatures. They float along through life and even when things get a bit bumpy, they just seem to carry on with a smile on their face, and if they tip over, mostly they right themselves. Great things to aspire to. When Did You Start Collecting Ducks? A long time ago in a galaxy far, far away….”, oh sorry, that’s Star Wars.Truthfully, I really have no idea, it was a long time ago and I cannot possibly explain how much joy and how many smiles I have witnessed because of these Ducks. Do All The Ducks Have Names? No, however some are already named when they arrive (e.g. “Fifi”and a few have obvious names (e.g. “Tiffany”, a rather gorgeous blue Duck wearing pearls, and “James Pond”). How Many Ducks Have Numbers On Them? I think there are three. Number 24, and my two retired Racing Ducks, #208 & #784. 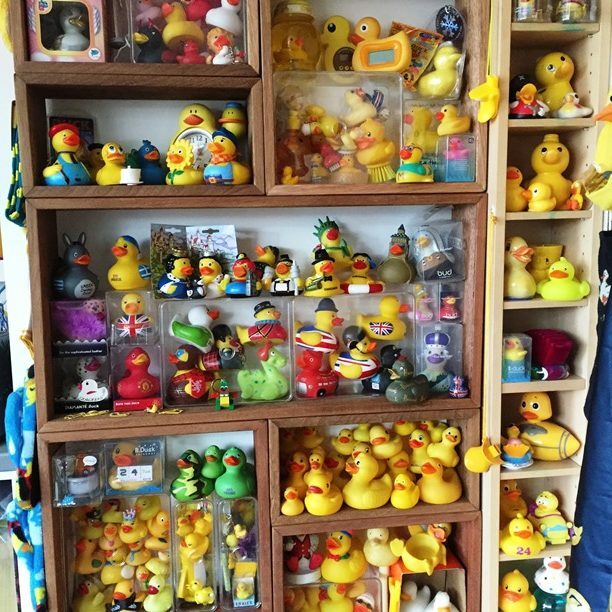 Do You Have A Favourite Duck? No, not possible! I couldn’t possibly choose, though I do spend a lot of time with Felix. ​Where do they come from? These Quackers have arrived from all over out world! Apart from the abundance of local Aussie Ducks, many have arrived from New Zealand, Germany, Norway, UK, USA, Thailand and New Zealand? If I’ve forgotten anywhere, please let me know! Why Do People Send You Ducks? Well often people like you visiting this page, or my blog posts, will be somewhere over the next few days or weeks and will see a Duck that they think would lovely in the Palace. They just have to buy it and send it to be part of this collection… That’s it! Believe me, it still surprises me how often a new Duck arrives out of the blue. Friends and family often give me Ducks as Birthday, Christmas and “Just ‘cos ” gifts. Do You Like Being Sent Photos Of Ducks? Yes! I usually post them on my facebook page, and that's the best placce to send them. Can I Visit Duck Palace? 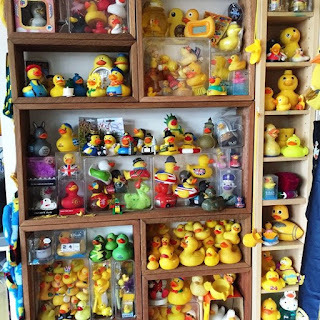 Unfortunately no, Duck Palace is a private collection. That’s why I post photos for your enjoyment. Perhaps one day I’ll open a little Art Gallery / Duck Palace / Gift Shop combo? Is It True You’ve Been On A Duck Adventure? Yes, a few! The first Duck Experience was on board “Darcy” with a terrific guide Nel. We enjoyed the sights of Singapore as well as a race with another Duck. The second was in Windsor, UK. I've been told there are Duck Adventures in all sorts of places, and perhaps keep an eye out in your area for fundraising Duck Races as they are lots of fun.